Spectacular winter scenery, cozy accommodations, and special holiday touches will make this a Christmas to remember forever. Spend Christmas day at the magical Chateau Lake Louise. The stunning scenery outside and incredible hospitality of your hotel are the perfect ingredients for a memorable Christmas. We’ll sprinkle your trip with Christmas magic! Find a decorated Christmas tree waiting in your room and dig into a feast you’ll never forget. Spend your days in the fresh mountain air with your choice of winter experiences. Go dogsledding, snowshoeing, or ice-walking – we’ll tailor your tours to your activity level. Welcome to Edmonton for your Canadian Christmas vacation. Edmonton is home to the Edmonton Oilers NHL hockey team, the largest mall in North America, and a great pub and foodie scene. Ask us for help choosing activities at West Edmonton Mall. An epic indoor waterpark, ice skating, roller coasters, and shopping are all at your fingertips! Enjoy a relaxing and comfortable transfer in a motorcoach equipped with comfortable seating and large windows as you make your way to your hotel in downtown Edmonton. Located in the heart of North America's largest shopping and entertainment complex, the West Edmonton Mall. The Fantasyland Hotel features classically decorated rooms as well as a variety of theme rooms. From astronaut, to Western, to Canadian Cabin themed, there is a fun, unique accommodation experience to suit everyone. After a morning at leisure, make your way into the Canadian Rocky Mountains. The charming town of Jasper welcomes you with glacier-fed lakes, forests, rivers, and an eclectic choice of restaurants and shops. Spend your evening roasting s'mores by the fire wrapped up in a warm, cozy blanket under a starry sky. A private vehicle and driver will take you from Edmonton to Jasper in comfort. Wake up to your first day in the Canadian Rockies. Enjoy a fresh cup of hot coffee as you gaze at the frozen mountain scenery outside. Follow along side Small Rivers' meandering frozen waters by dog team through the silent, undisturbed beauty of winter and all it has to offer. Enjoy the crisp mountain air and the beautiful scenery that surrounds you while you warm up with a hearty lunch cooked over an open campfire by the trail. Learn all about the history of the area and the dog sled sport, as well as fuss over your new-found furry friends. Put on your boots, parka, and mitts and immerse yourself in the wonderful winter activities at your doorstep. Ride the Steel Rails! Enjoy breathtaking views of the Rockies aboard VIA's Skeena Train. Experience both the train and a small personalized sightseeing tour all in the same afternoon. Travel the shores of the mighty Fraser River to the historic Dunster Station and into British Columbia's stunning Robson Valley. Welcome the morning as you head south along the Icefields Parkway This scenery is just a warm up for the sight that greets you in Lake Louise – glaciers, ice castles, and christmas lights. There is no better way to spend time together than taking in the beauty of sparkling snow on a horse-drawn sleigh ride. Enjoy views of the Chateau Lake Louise and spectacular, natural mountain scenery along the way. The traditionally styled sleigh features cozy, upholstered seats and blankets to keep you warm while your guide shows you the sights, western style. This evening, savor a Swiss-German inspired menu on Christmas Eve at this intimate restaurant. Stylish decor and spectacular views, create the perfect ambiance for a memorable experience during the holiday season. To make your holiday season more like home, we've pre-arranged for you to have a beautifully decorated Christmas tree right in your own room. Enjoy a relaxing and comfortable transfer as you make your way through the stunning Rocky Mountains from Jasper to Lake Louise by bus. Awaken Christmas morning surrounded by your loved ones and glistening mountain peaks. Your stay includes a decorated Christmas tree to make you feel like you aren’t too far from home. The hotel offers a variety of activities such as ice-skating, special Christmas programs, cross-country skiing tours, and tobogganing. Try out the lakeside Ice Bar and make your own maple taffy treat on the snow. Hot cocoa and cocktails will be available to warm you up! Celebrate Christmas day this evening with a beautiful view of Lake Louise through the Victoria Ballroom's floor to ceiling windows as you help yourself to an extensive and elaborate, Chef-attended Christmas dinner buffet. Travel to Banff, the liveliest of the mountain towns on your Canadian holiday. Wander the high street boutiques looking for last-minute gifts, or down the scenic Bow River boardwalk. Sit back, relax and enjoy the scenery as your private driver and vehicle picks you up at your hotel in Lake Louise and transfers you to Banff. Decorated with a blanket of deep snow and icicles, Banff is the perfect landscape for your bucket-list Christmas trip. Visit Banff Hot Springs where you can warm up after a day of winter exploring! Ask us about adding a mountaintop fine dining experience at the Sky Bistro. Explore the icy beauty of Grotto Canyon and see ancient native pictographs using special hiking crampons to grip the smooth frozen creek bed. Your guide will point out the stunted pine forest and hidden ancient native pictographs, which were likely created by Hopi visitors from the Arizona region. Snowshoe on an easy trail across the frozen Vermilion River and along the snowy path winding through a forest of pine trees to the Paint Pots. A cultural treasure within Banff National Park. Learn about the history of the fur trade as you explore, and about the mineral deposits once used by First Nations people for rock painting. Along the way you will hear stories of Banff’s indigenous people, explorers and fur traders who lived in and traveled through the Rockies. Soar to the top of Sulphur Mountain on the Banff Gondola to experience a stunning bird's-eye view of six incredible mountain ranges. Today is another fun-filled day in Banff, catered to your pace and interests. This exciting adventure offers fun for everyone. Stunning Rocky Mountain vistas surround you as you ride through the powder in the Kicking Horse Valley above the treeline. Enjoy a delicious mountainside BBQ lunch with your fellow riders while warming up by the fire before heading back to town. Relax and unwind with a customized, medium-pressure massage at the luxurious and tranquil, Willow Stream Spa. This massage will focus on the areas of your body that are most tense, from your head to your feet. This is a great choice for ultimate vacation relaxation! Take to the mountain slopes today with your Tri-Area lift pass complete with rentals. Choose to explore the runs at Sunshine Village, Mt. Norquay or Lake Louise. No matter your choice you will be thankful for snowy peaks and freshly groomed runs awaiting you. Your magical Christmas vacation comes to an end today as you travel to Calgary. Overnight at the Banff Caribou Lodge & Spa. Your hotel is just a short walk from downtown. Enjoy one of the many spa treatments the lodge has to offer or rent a bike and head out into the town to explore. Amenities include a large 26-person jetted hot pool, steam room, fitness room and complimentary Roam Bus pass valid on the transit system, to help you get around town during your stay. ✔ Comfort and Superior levels include scheduled coach transfers. Deluxe level is paired with a private car and driver transfers (except for Edmonton to Jasper). Occasionally, activities may vary due to weather conditions. Dog Sledding Tour in Jasper: Early and late season departure are not guaranteed as the tour requires optimal snow conditions to be able to operate. Dogsledding tours also require temperatures above -30 degrees Celsius to be able to operate. 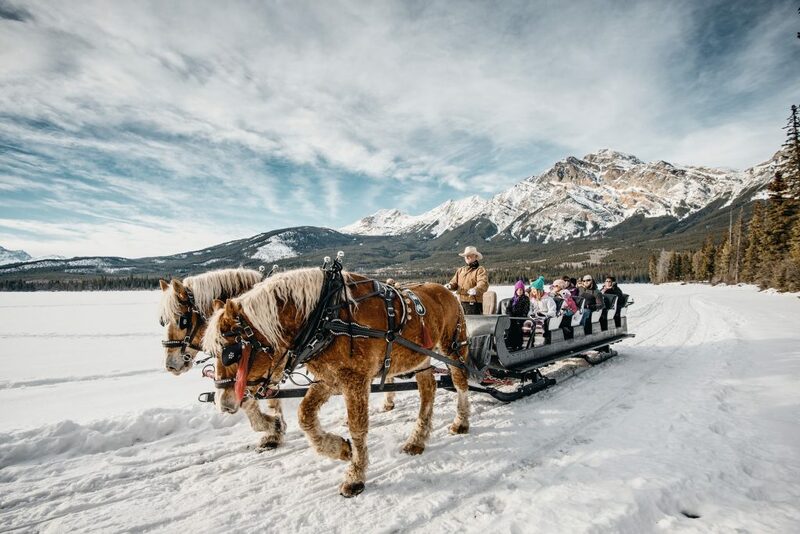 Lake Louise Sleigh Ride: This tour is weather dependent and relies on optimal snow conditions in order to operate, departures in December and April could be affected. Grotto Canyon Icewalk Tour: Departures in early December and in April may be delayed as this tour is weather dependent and required snow and colder temperatures in order to operate. Paint Pots Snowshoe Tour: Departures in mid-November to early December and in April may experience delays in departure as the tour is snow and weather dependent and is unable to operate unless there is optimal conditions. This trip is available for departures in December.